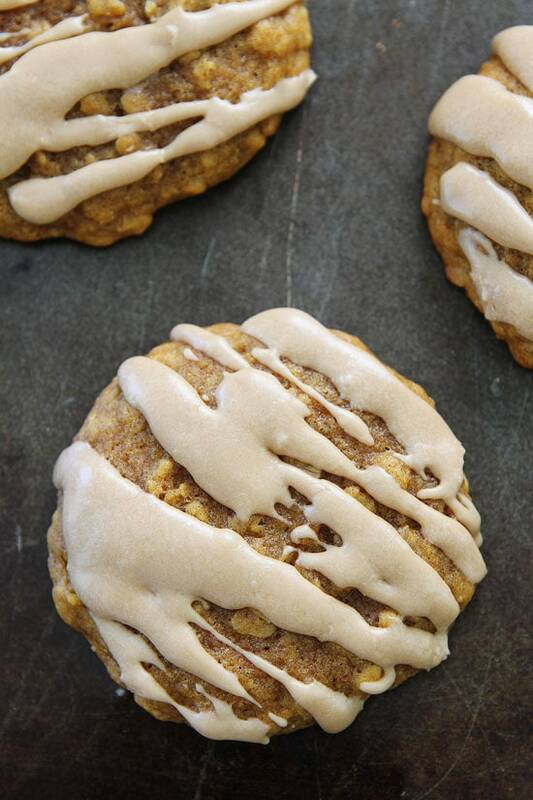 Pumpkin Maple Cookies-chewy, soft pumpkin oatmeal cookies with a sweet maple glaze. These cookies are a real fall treat! Oooooh, Monday. I did not want to see you this morning. I spent most of my weekend at Deer Valley for the Better Blog Retreat (I will share a recap soon). I had an amazing time, but I didn’t get anything on my to do list done and I didn’t get to spend enough time with my boys. SO instead of having the Monday blues, I am going to extend my weekend. I am going to stay in my pj’s, read stories with my boys, turn on some tunes, and bake Pumpkin Maple Cookies. Take that Monday! Maple donuts are Josh’s all-time favorite donuts and he is passed his love on to our boys. Caleb and Maxwell both love maple donuts. Maxwell has only had a few tastes, but he savored every little bite! I am not a huge donut fan, I save my calories for cookies. I do like the flavor of maple though, so I made a Pumpkin Maple Cookie, the best of both worlds. And since it is fall I HAD to use pumpkin because pumpkin is everything right now…and the pumpkin maple combo is legit. 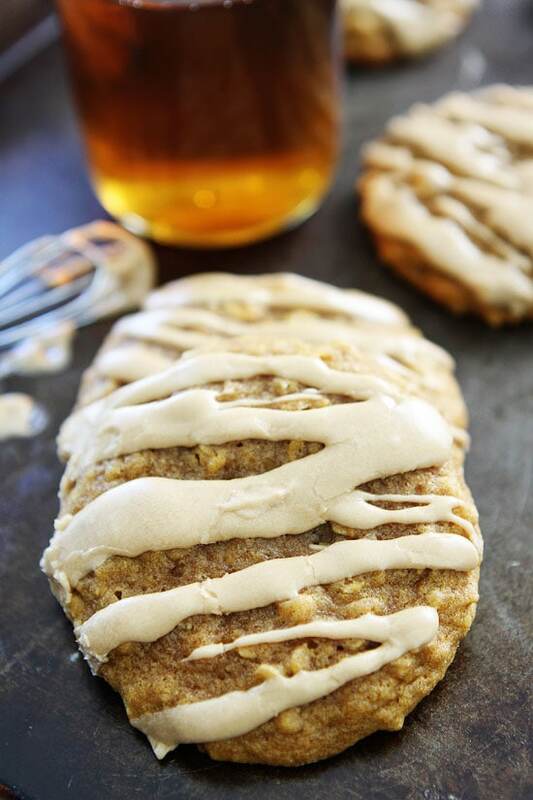 The pumpkin oatmeal cookies are soft, chewy, and sweetened with pure maple syrup. My boys favorite part of a maple donut is the glaze, so I made a sweet maple glaze for my cookies too! The drizzle took the cookies from good to GREAT! Boycott Monday with me and make Pumpkin Maple Cookies. You will be glad you did! 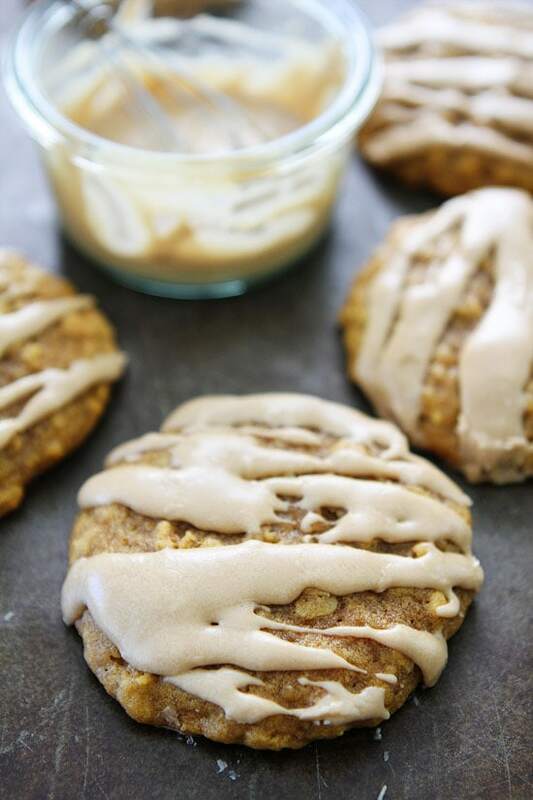 Soft and chewy pumpkin oatmeal cookies sweetened with pure maple syrup and drizzled with a sweet maple glaze. 1. Preheat oven to 350 degrees F. Line a large baking sheet with parchment paper or a silicone baking mat. Set aside. 2. In a medium bowl, whisk together the flour, baking soda, pumpkin pie spice, and salt. Set aside. 3. In the bowl of a stand mixer, beat butter, brown sugar and granulated sugar until light and fluffy. Add egg and vanilla extract. Beat until combined. Beat in the pumpkin and maple syrup until smooth. Gradually add flour mixture and mix until ingredients are incorporated. Stir in the oats. 4. 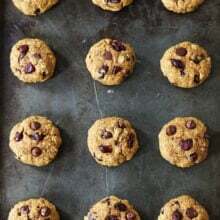 Drop cookie dough by rounded tablespoons onto prepared baking sheet. 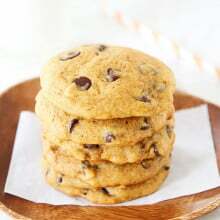 Bake cookies for 12 minutes or until cookies are lightly browned. Cool on baking sheets for 2 minutes; transfer to wire racks to cool completely. 5. While the cookies are cooling, make the glaze. In a medium bowl, whisk together melted butter, powdered sugar, maple syrup, maple extract, vanilla extract, and milk. You may need to add a little more milk if the glaze is too thick. Whisk until smooth. 6. Drizzle maple glaze over cooled cookies. Let sit until glaze hardens. Serve and enjoy! Follow twopeasandpod on Instagram and show us what recipes you are making from our blog! Use the hashtag #twopeasandtheirpod! We want to see what you are making in your kitchen! Everything about this is so right! It doesn’t get better than pumpkin AND maple! These look delicious! I’m also not HYOOGE into donuts either, but cookies? MAN OH MAN, those are MY JAM. The pumpkin and maple combo here is AMAZING. I could eat the whole batch! These sound fantastic! 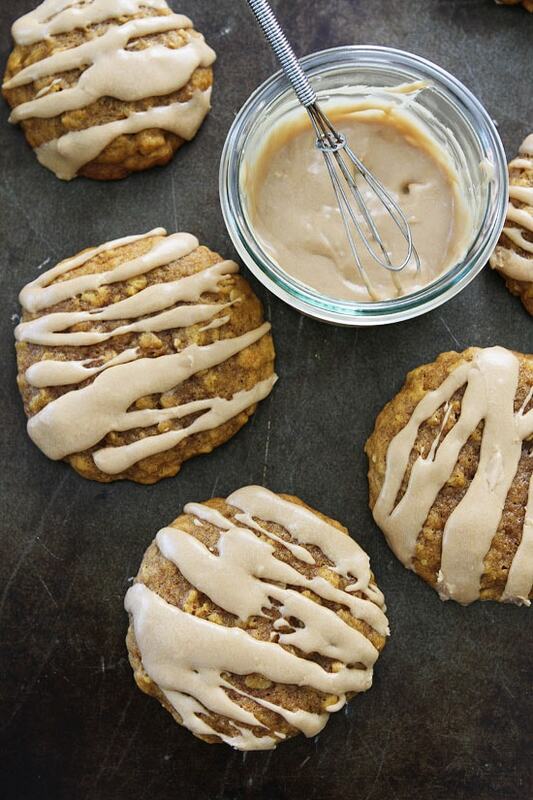 I’m not usually that excited about pumpkin, but the addition of oatmeal and maple makes these cookies sound irresistible! Thanks! They are a new fall favorite! Yep, making these ASAP! I am a sucker for the maple and pumpkin combo! I hope you like them!! I need a spoonful of that glaze! 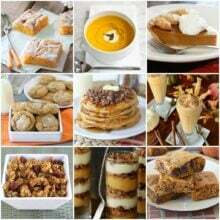 Pumpkin and maple are the best Fall combos! Great cookie! Love the maple and pumpkin together. They look lovely! I especially like the maple glaze. I am excited to make these- but my grocery store didn’t have maple extract or flavoring! Can I substitute more maple syrup? If you can’t find the maple extract/flavoring, you can leave it out. They will still be really good! Enjoy! These include ALL my favorite Fall flavors!! DEFINITELY making soon! LOL, I save my calories for cookies (and cookie dough), too. These cookes look worth the indulgence! obsessed with the glaze on these bad boys!! You saved me from overthinking what to bake for halloween! This is just perfect! Wow, these look amazing and so does your blog! I’d love to try a gluten free version some time!! Definitely a perfect fall combo, yum! I love sometimes dropping everything and having a weekend wothy day. They’re even better than regular weekends! These cookies look great as well. Perfect for fall! I just made these tonight. They were delicious! I used Namaste gluten free flour and substituted just a tiny bit of almond extract for the maple in the glaze and it was amazing! Thank you for sharing! I made these cookies yesterday. They are so moist and delicious. They’re completely addicting! Loved them! 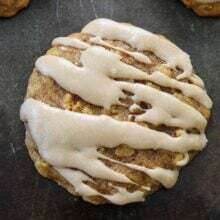 I added a little salt to the glaze ending up with a pumpkin maple cookie with salted maple glaze – awesome! I made these today. What a wonderful recipe!!! These are maybe my favorite cookies ever. 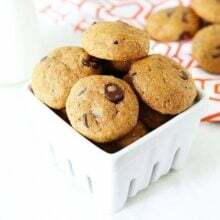 We’ve made them as directed but I just made a batch with Bob’s Red Mill gluten free 1:1 baking blend and they’re perfect. You’d never know the difference. Thanks so much! Tremendous recipe. Amazing flavor combination! These were a huge hit! Thanks for the recipe!